Nothing is more boring than a simple van, right? That's what you'd think, but you couldn't be more wrong. It ain't pretty and it doesn't like the highway, but it's built to last and it can go absolutely anywhere. It's a small apartment that can cut it with anything but Jeeps offroad. Oh, and Porsche made a high-power version called the B32, too. You know a vehicle is simple and rugged when they make the body panels corrugated. It's the van that helped get postwar France back on its feet and it looked damn good doing it. You might remember an '80s Caravan for being a fake woodgrain turd, but if you crank up the boost, you can transform these things into the ultimate drag strip sleepers. Check out Turbovan.net for more info. Again, you might only remember these from soccer practice, but a simple V8 swap and suddenly you have the coolest drift car you can imagine. On top of that, in stock form these things are basically unkillable. You can see them working as taxis all over the world, and angryenoughtopost has a great story on how one couldn't even be killed by the Cash for Clunkers program. Read the whole story right here. Back in the '60s, GM built a better VW Van. They called it the Greenbriar and they're the flat-six, rear-engine, rear drive vans you've been dreaming of. Gary Watson even built one into a wheelstanding quarter mile monster. Yes, that guy is standing outside of his wheelstanding van in that picture. "Dajiban" is how they say "Dodge Van" over in Japan. What makes them so great? They lower these things, toughen up the suspension, power up the motors and take them racing. Seriously, these are full-size Dodge vans built up like road racers and thrashed on track (pics here). Doesn't get cooler than that. Are you convinced that the government is secretly tracking your brain waves and trying to steal your idea of an orbiting microwave death ray? You need to escape into the Arizona desert for a few months, or maybe years. There's only one conversion van you can trust to take you absolutely anywhere, and it's the Quigley 4x4 Ford Econoline. Ford built a couple huge-engine "Supervans" for publicity purposes, but the coolest supervan is one that they didn't build. I'm talking about the XJ220 Transit, built by racing team TWR for Ford to test the running gear of the upcoming XJ220 in secret. Basically, it's a plane-jane Transit with a 542 horsepower twin-turbo Group B engine in the middle. Hard to beat that. It is hard to outdo the XJ220 Transit, yes, but someone did it. 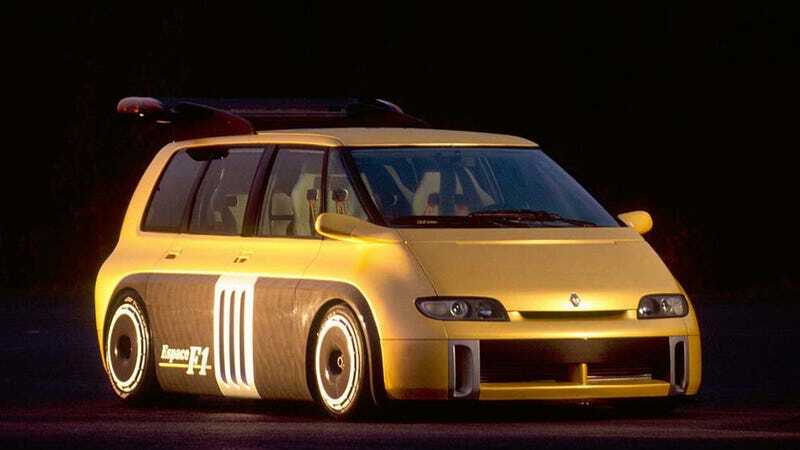 I'm talking about the Renault Espace F1, which is just what you think it is — a Renault minivan with a Renault F1 V10 engine in the middle. It was built by Matra in 1995 as a demonstration car to scare journalists in. It's got four seats, ten individual throttle bodies, and one massive wing. It's about as gnarly as a van can possibly be.